Storefront for e-Dropoff's new Gold Coast location. 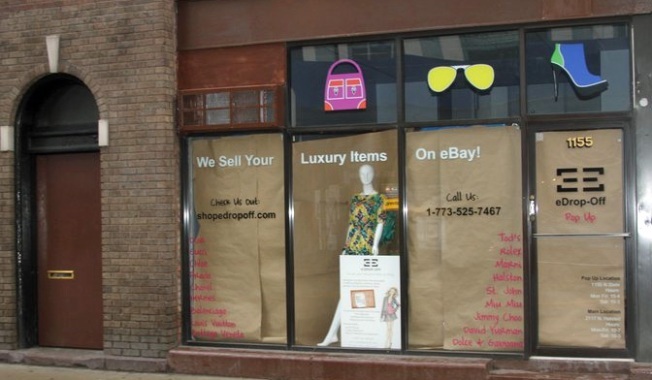 Luxury consignment store eDrop-Off is about to get some new digs. The popular store, which also serves as an eBay drop-off service, is opening a year-long pop-up shop on the corner of State and Elm, according to Popsugar.com and confirmed by the store's blog. The store recently moved into a new Lincoln Park location, but the additional Gold Coast spot will place the store closer to many of the clientele who won't blink about dropping a couple thousand bucks on a purse -- or have similar items in their closets collecting dust. It may also make for some interesting footage for the reality show eDrop-Off founder Corri McFadden has been shooting all over town. The opening date for the new store is scheduled for March 28th.